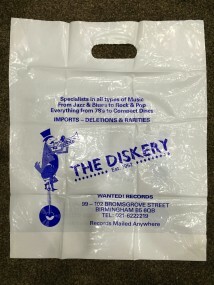 The Diskery Record shop, opened by Morris Hunting in Hurst Street, now resides in Bromsgrove St, B5 6QB‎ – 0121 622 2219‎. 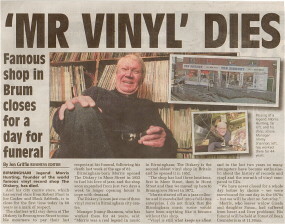 It is one of the very few remaining independent record shops in Birmingham, with a predominant vinyl stock catering for all tastes (although originally jazz and swing). The shop was established in 1952, now the second oldest surviving record shop after Spillers in Cardiff. 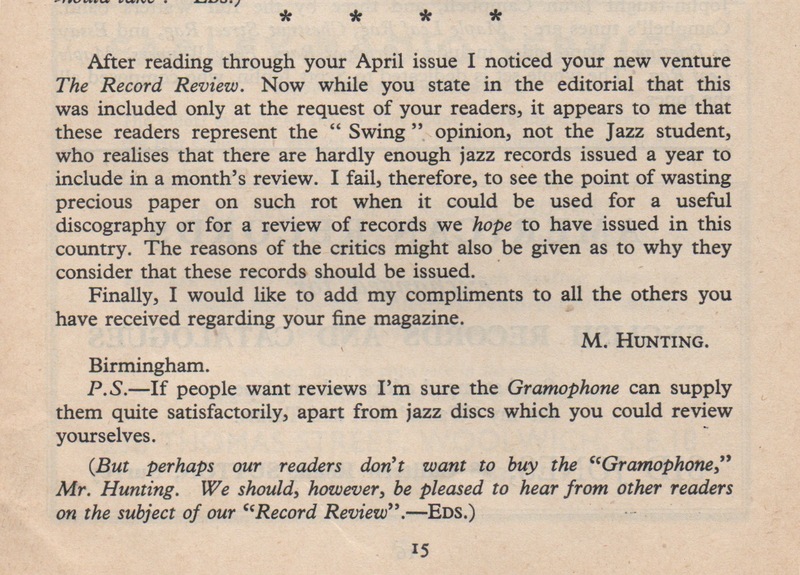 Five years prior to opening the shop, a frustrated Morris Hunting wrote to the then jazz magazine, PICKUP [June 1947], venting his frustration. A wonderful insight into his shop’s eventual opening. Information suggests the shop first opened in Union St in 1952 but actual company records do not show anything during 1952 (this could simply be a case of the shop opening slightly after the records were submitted). 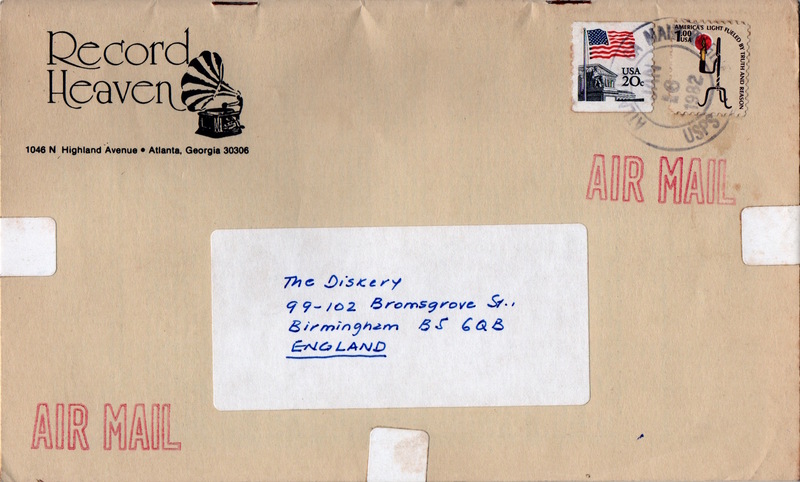 1953 records are still being researched. Research shows the shop was then situated at 82A Hurst Street B5 between 1967-1974 (again, under further investigation). In this audio visual slideshow, Sam Coley visits the shop and talks to Jim and Liam about the shop and its history. 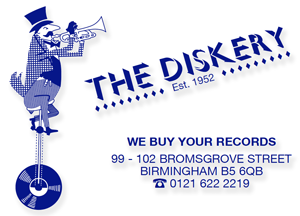 If you love music and are in Birmingham, make sure you go and visit the store. I hope your well ? I have a friend who is looking for an Album or Cd he can’t locate I’ve looked all over various sites for him and can’t find it anywhere. Then I thought if I wanted anything not listed I would visit your shop and I don’t know where you get things from but you usually succeed. So here is the challenge the Album was released in 1973 Wizzard “See my Baby Jive” not the single. Hope you can help. See you soon. Jim Liam remember you both well, mainly Hurst street, Jim Liam in them days I was running a Disco called Touch of class, in fact think it was you that asked us to go resident in a town night club, but declined. The thing is both I still have my records and want to sell. LPs with my records, approx 2000 in boxes. I would like to think I would get £200 the lot, some are out of the sleeves but still have them separately. would you be interested ? have no use at 74 now only memories. 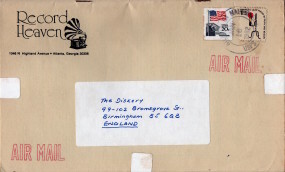 regards Bill Pearson. i have hold of about 90 12” records ranging from jazz soul classical orchestra. They belonged to my grandad who was a musician and piano teacher who passed away a few years ago and we are now sorting out some old belongings. I believe some of these could be quite rare and maybe of value to someone with interest in this topic. 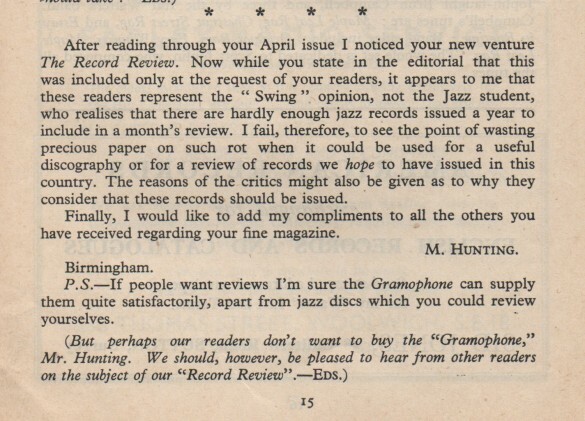 I saw a few sites about dealing with old records and thought I would ask around what is reccommend before making a decision what to do with If anybody has any ideas get back to me that would be great. bought my 1st overseas lp off you in 1967. still got it. . mothers of invention… hungry freaks daddy… cost me £4.19.6d to get it shipped in from the states. still got record !! 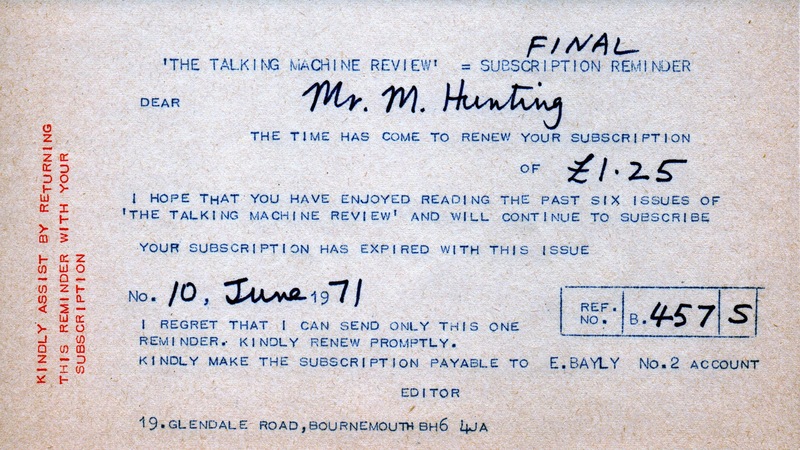 I used to come into the shop in Hurst Street during the sixties,and we used to do swap deals with each other,as I used to import records from the US myself,but of course on a much smaller scale than yourselves.Very rarely did any money change hands.I presume to shop is still dealing but where exactly are you situated now. 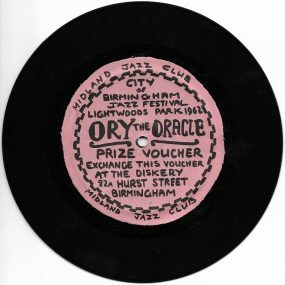 As I would like to get some money for my old records now,mainly from the US,but also many british labels,mainly Rockabilly,rock n roll,some country,a lot of rarities such as SUN,PHILLIPS INTERNATIONAL,all original pressings.Please get back to me with information about contact etc. Hi Guys! I’m from Brazil, Rio de Janeiro and I’ve saw a program TV about The Diskery. I love it. I have more than 600 vinil (rock, jazz, samba, bossa nova and other brazilians songs). If you want some, tell me. I intend go to your town just to know you. See you!!! Bought Al Capone by Prince Buster in 1969 and some b*st*ard stole it but the Diskery got me another copy …magic! I have loads of old records. How do you operate? Do people just bring you loads of stuff in, or do you have specific requirements. Will you be selling green day demolicious on Saturday? Dropped in today…..1st time for about 12 years…..last time i was on my bike pedaling home from work. 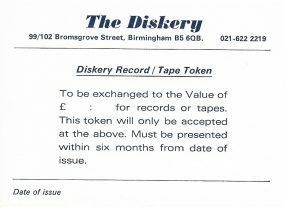 Growing up i spent more time in the Diskery than i did at home, then in the early 70s i started working at Rebeccas & Barbs as a Dj so the Diskery could take up most of Saturdays. Happy memories. Started using the Diskery when I was 12 so that’s 56 years of amazing record buying from an amazing shop with great , knowledgeable and friendly dudes . Hope guys keep rocking on for many years to come . Thanks for the vinyl , as a pro drummer it still brings me lots of pleasure. Went in recently & met Liam….Jim had got the day off. 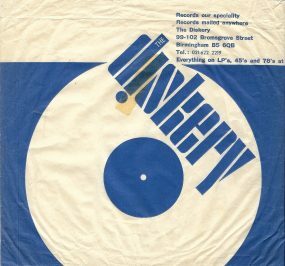 When i started DJaying in the clubs & the shop was in Hurst St i gave Jim a list of every oldie i was after. Three weeks later he’d got most of them for me. Problem was i hadn’t got the money for all of them. 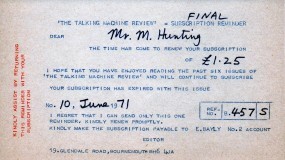 I was earning about a tenner a week & the bill was about £50. £3 a week for the next 4 months. People still can’t get their heads around the fact that when i was at Rebeccas & a few other clubs the money was something like £3 a night. Good fun tho’. 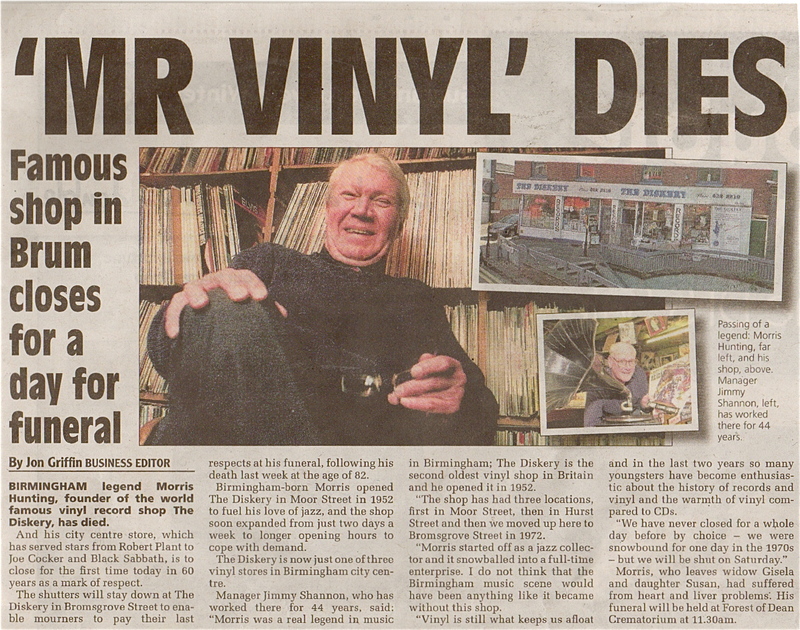 Sad to hear Jim has now left what was the best record shop anywhere he and Liam where the diskory nothing was ever to much trouble in helping to find that ilusive tune . Thanks for great memories and great times when evere we paid a visit to you both. Hope the business continues well in its new and current form. The Diskery is a legendary shop and I bought lots of fine LPs and 45s when I dropped in there while researching my book on the history of the UK record shop. Lee and Danny were very amenable and I look forward to returning. Oh my book is now published and it features The Diskery in many chapters – Going For A Song: A Chronicle Of The UK Record Shop.